Penanggungan from the Lapindo mud flow, with two of its four side peaks. Gunung Penanggungan (1,653 m) is about 55 km south of Surabaya in East Java and north of the Arjuna-Welirang mountain complex. Its mythological origins and the many small Hindu temples on its slopes are fascinating. It is one of the most delightful small mountain climbs in Java. 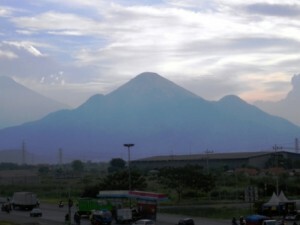 Penanggungan is one of several sacred mountains in Java. 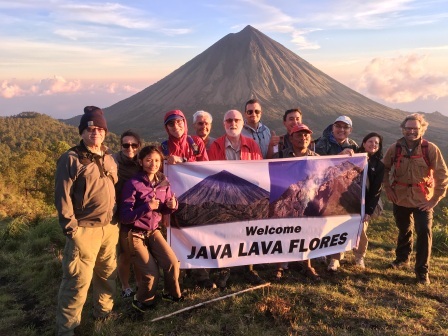 Others – Semeru and Bromo, Argopura, Arjuna, Merapi, Dieng, Muria, Lawu? 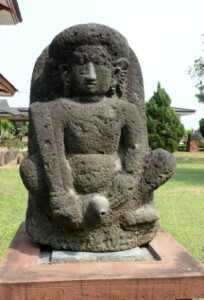 The mythological origins of Semeru and Penanggungan: Mount Meru, the abode of the gods, is a sacred mountain in Hindu cosmology considered to be the center of the physical, metaphysical and spiritual universes. The ‘gunung‘ in the wayang symbolizes this cosmos. 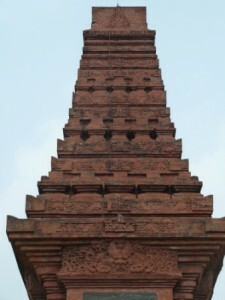 Another myth relates that the gods cut the top off Meru and transplanted it to form Penanggungan. In Hindu mythology, Meru has four terraced ledges, the first being the ‘heaven’ of the Four Great Kings facing north, south, east and west. Interestingly, Penanggungan has four lower peaks around its base in an almost perfect square formation – Bekel (NE), Mungkur (SE), Kemuncup (SW) and Saraklapa (NW). Symbolic connection with the Four Great Kings? Following the reign of Hayam Wuruk (died 1389), the Majapahit dynasty experienced slow political decline due to internal conflict exasperated by the maritime campaigns of the famous Chinese admiral Cheng Ho (early 1400’s). During this period, traditional Hindu cults declined in favour of the more archaic worship of the Lord of the Mountains. 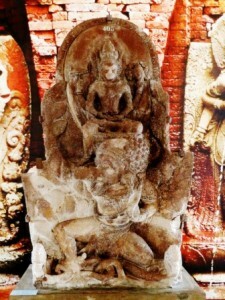 While the cult of Shiva was associated with kinship, fertility and creativity, the cult of the Lord of the Mountains was associated with liberation of the soul. Superstition and familial salvation cults gained in popularity and the building of small familial shrines was encouraged. 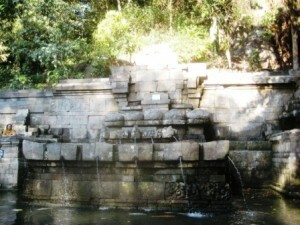 The slopes of Gunung Penanggungan were covered with numerous ritual sites. (Paul Michel Munoz, Early Kingdoms of the Indonesian Archipelago and the Malay Peninsula, 2006, Singapore). 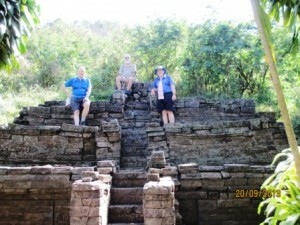 Dutch archaeologists identified 81 temples on Penanggungan in the 1930’s; Indonesian archaeologists now report up to 126 temples. Jolotundo baths. Note: ladies baths on the left; men on the right. 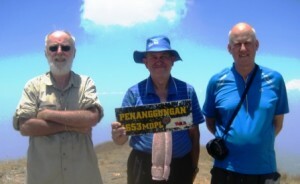 Java Lava has explored Penanggungan on several occasions – a traverse over the summit to Trawas (2013), and the Bekel trail (2015). Both times, we stayed at the PPLH Environmental Education Centre (375 m) and started the climb from the Jolotundo (560 m), the beautifully preserved Hindu holy baths. The walk from the Centre to Jolotundo takes about 30 minutes. The summit climb is about 1,100 m vertically – the usual hard slog – assume four plus hours. 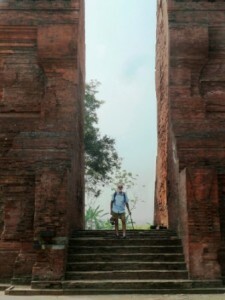 From Jolotundo, the trail is along the usual tourist route and passes five small temples: Bayi (909 m), Putri (1,083 m), Pura (1,110 m), Gentong (1,153 m), and Sinta (1,157 m). 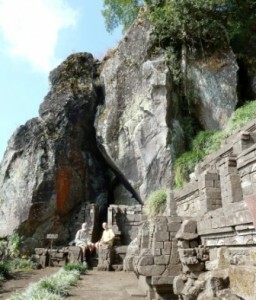 Except for Gentong, these temples are rather unimpressive being in poor state of repair. The ancient crater is grassed-over and has good camp sites but no water. The rim offers great views of mountains to the south. A camp on the summit on a full moon would be a mystical experience. The descent, if traversing the mountain to Trawas to the SW, would be very slippery in wet weather and, in any case, is rather uninteresting. We suggest to descend by the same route to Jolotundo. Suitability: families and older children. 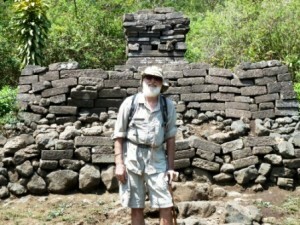 The Bekel trail: at the Sinta temple, the trail divides: straight ahead to the summit, or left to Gunung Bekel.The temples (Candi) on Gunung Bekel trail are rarely visited: they include Yudha (1,086 m), Pendawa (1,078 m), Naga I (1,126 m), Puncak Bekel (1,245 m), Kendali Sada (1,127 m) and Kama II (993 m). The track is overgrown and involves two very steep ascends/descents. A guide is essential. Puncak Bekel offers a clear view of the route to the summit. Some other temples on the mountain face can been seen from here – bring binoculars. Suitability: because of the several very steep slopes, confident trekkers only – no children. 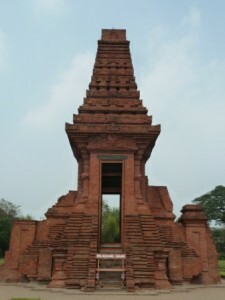 Trowulan, the ancient capital of the Majapahit empire, is about an hour away by car and very well worth a visit. 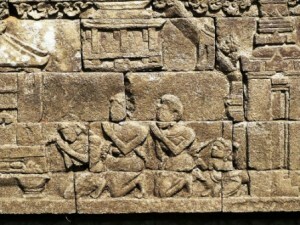 There are several excavated/renovated temples, baths, etc. 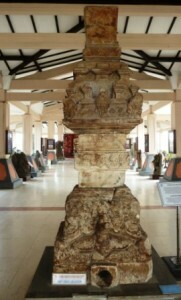 The museum contains many artifacts. 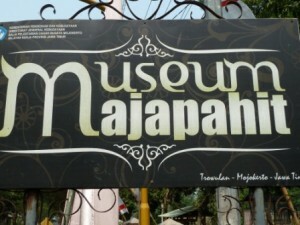 Most displays have Indonesian and English explanations – but the English is absolutely woeful. See collection of photos below.